Dorando’s surreal strychnine-induced stagger and repeated falls at the end of the race transfixed the crowd. 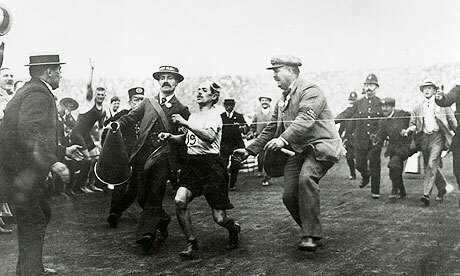 Dorando’s memorable final lap inspired a young unknown song-writer named Irving Berlin to stardom as well a sportswriting stint for Sherlock Holmes creator Sir Arthur Conan Doyle. This entry was posted in Speeches and Special Presentations and tagged Irving Berlin, Italy, marathon, popular music. Doc Stull was the featured speaker at our Lodge potluck in January 2014. He could not have been more engaging or entertaining. His wry sense of humor and storytelling ability captivated a group that normally begins to fidget after five or six minutes of an average presentation. Doc immediately set the group at ease by preceding his talk with a difficult mnemonic display and an appropriate, timely, and hilarious personal anecdote. The main subject of his presentation fulfilled our Lodge’s goal to have an informative heritage presentation at each monthly meeting. Stull’s substantial historical knowledge and background information (not to mention his 35 years of teaching experience) without a doubt make him a California treasure.